To learn more about the Onondaga Lake Conservation Corps or participate in future activities, please contact Chris Lajewski at montezuma@audubon.org or call 315-365-3588. The State University of New York College of Environmental Science and Forestry (SUNY-ESF) and Honeywell are working in partnership to create a sustainable Shrub Willow Farm in Camillus. The shrub willows are creating a productive landscape that is generating renewable energy while providing an effective, vegetative cover. The willows also offer improved habitat for wildlife. 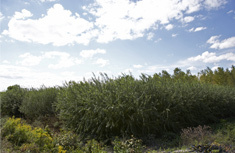 For more than two decades, SUNY-ESF has promoted the commercialization of willow crops for bioenergy, biofuels and bioproducts. 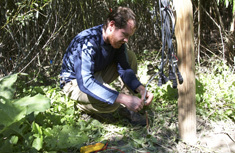 In 2004, SUNY-ESF and Honeywell began planting the shrub willows. Today, more than 100,000 willows thrive on 15 acres. This May, SUNY-ESF and Honeywell started the preparation of another 25 acres for shrub willows to be planted later this year. SUNY-ESF and Honeywell plant shrub willows to generate renewable energy, improve habitat for wildlife, and provide an effective vegetative cover. Shrub willows have a history in Central New York. Native Americans have long understood the benefits of the willow for medicinal purposes, as construction material, and to stabilize stream banks. European immigrants in the 1840s cultivated shrub willows to make baskets and furniture. By the early 1900s, there were more shrub willows grown and willow baskets produced in Onondaga County than any other county in the United States. 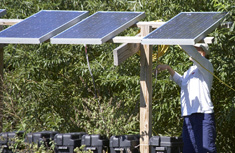 In about three years, the willows planted now can be harvested to produce renewable energy. During the 1980s, as concerns about climate change and energy independence grew, Central New York once again focused on the shrub willow — this time as a productive source of renewable energy and biofuels for the region. 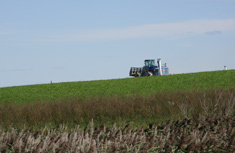 The first test plots were planted in Onondaga County by SUNY-ESF in 1986. Research since then shows that, in addition to creating renewable energy, the fast-growing crop can be used to create living snow fences and restore land. Trucks have started delivering the organic mix necessary for shrub willow growth. In mid May, trucks began the delivery of Stable Peat™— a natural, organic mixture that adds nutrients and enhances the growth of the shrub willows — to the site. This organic material, which looks and smells like mulch, is mixed into the ground before the willows are planted. As in prior years, dust control is of primary importance. Through July, there could be up to a dozen trucks per day during normal weekday hours. If you live in Greenfield Village or are visiting Reed Webster Park, you might see trucks or equipment. Individuals interested in more information should contact Honeywell at 315-552-9784. For more information on the Onondaga Lake cleanup, visit www.onondaga-lake-initiatives.com. To ask a question or comment, please click on "Contact Us" or call 315.552.9784. For immediate construction related questions or concerns, please call 315.313.8068. The Onondaga Lake Visitors Center was designed and built by Honeywell to provide the public with access to the cleanup.